On 11 February 2018 field guides driving in the Manyeleti Nature Reserve reported a white rhino cow that was limping. Park authorities were unable to locate her and contacted the Southern African Wildlife College airwing and requested assistance in locating the animal the next day. 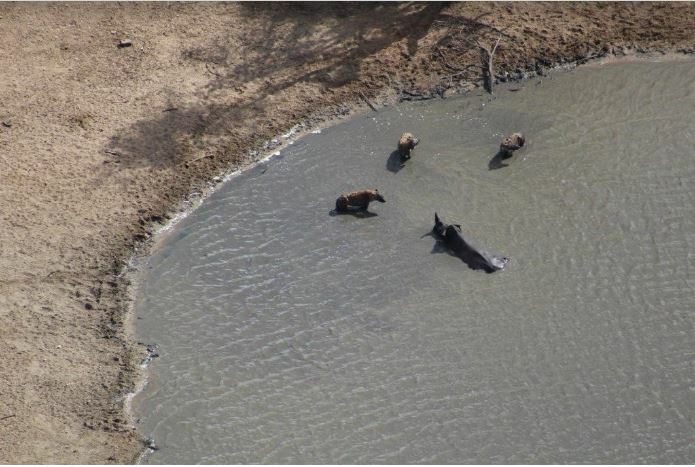 Flying over the dam in the vicinity of where the rhino had last been seen, the pilot was confronted with an unbelievable sequence of events. 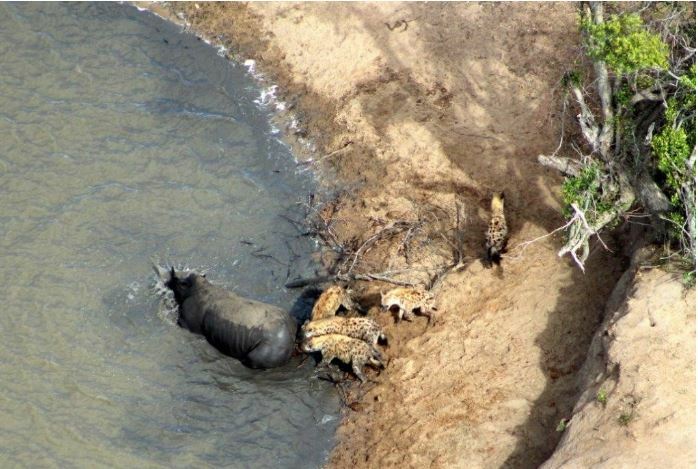 Five hyenas had trapped the rhino cow in the dam and were launching repeated attacks on her and were doing their best to kill her in the dam. They were biting her at the base of her tail and grabbing her by the ear and pushing her head underwater trying to drown her. (See the sequence of events pictured below). 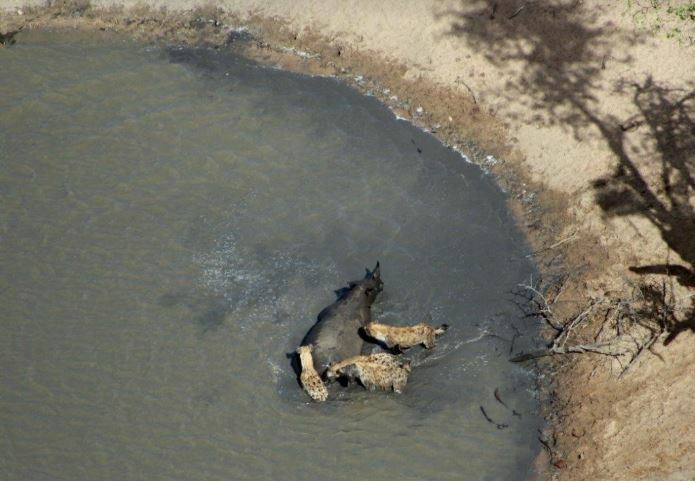 The pilot requested support from field rangers to chase off the hyenas until the game capture team could get to Manyeleti from Nelspruit. He proceeded to do a number of low-level passes over the scene for at least 45 minutes to chase the hyenas off the animal and keep them at bay while the field rangers rushed to the area. 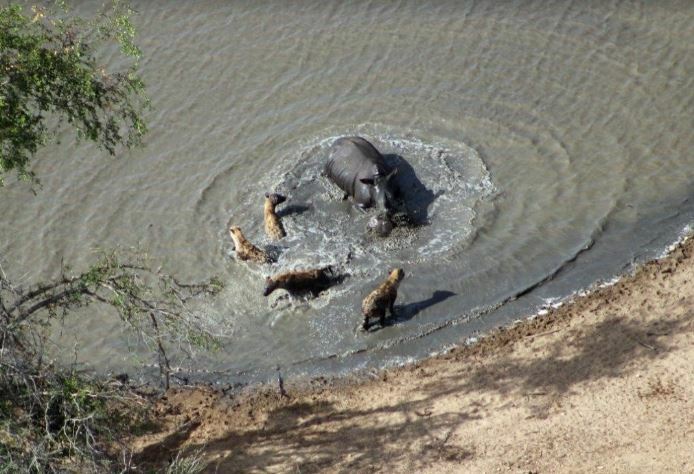 He managed to keep them off until the field rangers were about five minutes away and then unfortunately the rhino tired and they managed to push her head under the water one more time and drowned her. A subsequent necropsy by Dr. Kyle Piers, who is attached to the Hluvukani Animal Clinic, provisionally indicates that the rhino’s left front leg was badly injured and that there was trauma to its left lung. There was also muddy water in her airway and sinus. The possibility of her being a victim of a poaching incident has not been discounted. Special thanks from the team at Manyeleti to the Southern African Wildlife College aerial support unit for the time and special effort they put in to try to protect and save this rhino and all the other thankless times they assist on short notice, often under difficult conditions. While nature takes its course, incidents such as these are fortunately rare. What’s tragic however is that rhino, which have so few natural predators, continue to be under daily threat from poachers. South Africa is home to about 70% of the remaining rhinos in the world making it imperative that the College together with its partners, continue to counter wildlife crime. 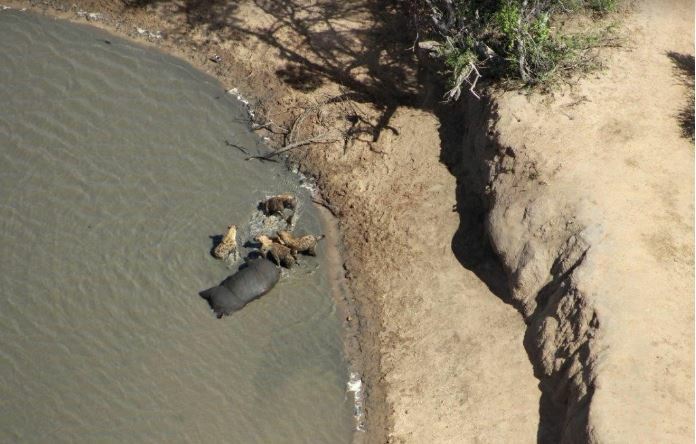 While it wasn’t possible to save this rhino in these circumstances, the College is working hard every day to conserve this iconic species through training, aerial surveillance, the support of its K9 unit and various community interventions. We're making some changes in the digital space!